As a Young Adult author I naturally love TEENS: their passion, their crazy energy and their potential for just about anything. Above all I love their stories and their voices. This blog is a place to talk about teens and writing and all the other random stuff that inspires me. The past five months I’ve spent even more time than usual attached to a chair. General household order and muscle tone number among the casualties, but The Revisions to the Next (as yet unnamed can you believe it?) Novel are almost done. 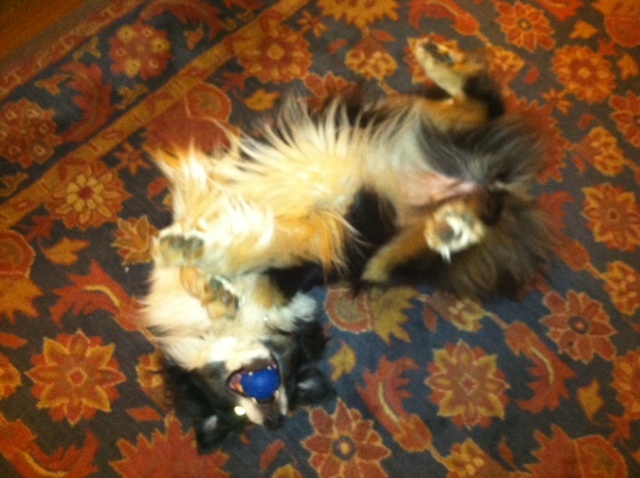 No one will be happier to see this phase of the writing process end than my Australian Shepherd, Frisbee. “Ah,” say those of you who know Aussies. You say this as you envision flying plastic discs, bouncing tennis balls, and random sticks hurled boomerang-style. You say this as you imagine an exhausted middle-aged woman trudging outside in all sorts of weather (Maine’s coastal weather can be summed up as “all sorts,” often within a 15-minute span) because an Aussie will walk. Every. Single. Day. You say this knowingly, even though I would delete the word, because it ends in –ly, making it an adverb, which, in this season of revision means it must go, go, GO! As Stephen King warns in his memoir, On Writing, “The road to hell is paved with adverbs.” And let’s face it: Stephen King would know how the road to hell is paved. For those of you who don’t know Aussies, think: somewhat dumber Border Collie. In other words, busy in the extreme, focused to the point of obsession, relentless … with a side order of lovable goofiness. If the Border Collie is the Harvard student with perfect SAT scores, the Aussie makes the honor roll and gets into the respectable safety school. Then plays Ultimate. Or rugby. At any given moment as I write, rewrite, and unwrite (which feels like an appropriate word for the detangling this manuscript has needed) I can look across the room to the futon where Frisbee pretends to nap (yes, this entitled dog jumps up on the furniture) and at the slightest movement from me her eyes will open, wide, and she will channel “Are we ready to go YET? ?” She plays these Jedi Dog Tricks all day, and always succeeds. I could not pull off this work without her, and in this I am not alone. I was reminded of that this weekend, not only when I read Maira Kalman’s lovely essay “True Love” in the Sunday Times, but also when I met, for the first time, in the most unexpected setting (I was wiping tables; he was sweeping floors) the author Ron Currie, Jr. who commented he’d just spent the past 12 years inside with his dog and realized he needed to get out. The poet Mary Oliver devotes an entire volume, Dog Songs, to this bond. Here’s one that reminds me of my girl. First of all, I do not want to be doing this. Essential. I’ll be finished eventually. I won’t remember yesterday, or anticipate today. I’ll give you ten more minutes,” and he does.